Clarence Park Bazaar – Vintage sales and costume hire … Step into a time warp you won’t want to leave. All stock has been fully restored so it is a pleasure to put straight on and enjoy. 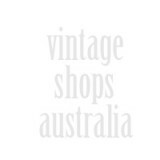 We have something for every vintage-fashion aficionado.